UNITED NATIONS — Russia's U.N. ambassador said Thursday there doesn't have to be a confrontation with the United States over a report that blames the Syrian government and Islamic State militants for carrying out chemical attacks in the conflict-torn country. 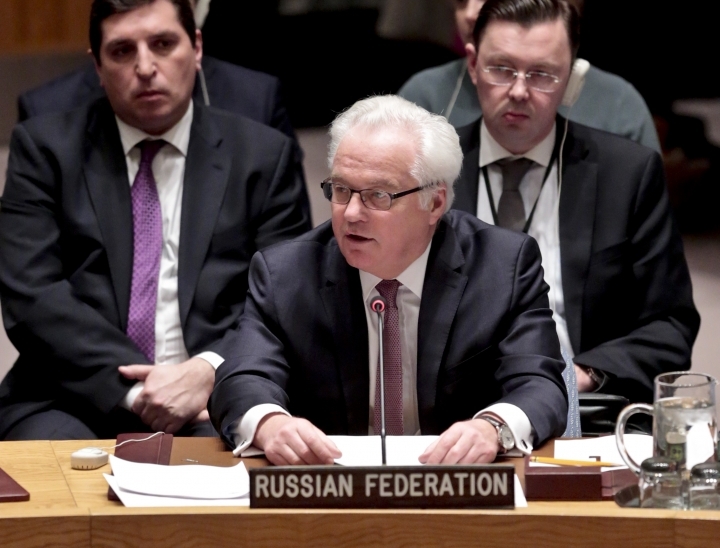 Vitaly Churkin, whose country is a strong supporter of the Syrian government, responded to predictions of confrontation by stressing that the U.S. and Russia created the investigative body to determine those responsible for chemical attacks in Syria. "It doesn't have to be the case," he told reporters, downplaying the predictions. "We have a joint interest in discouraging such things from happening, in preventing such things from happening." Churkin called the 95-page document produced by the international team from the U.N. and the chemical weapons watchdog "a very complicated report which needs to be studied by experts." He said it was "very important" that the team said definitively that Islamic State extremists were responsible for an attack using mustard gas "because usually all talk we heard about any use of chemical weapons was an effort to ascribe things to the Syrian government." But Churkin repeatedly sidestepped questions about the team's conclusion that the Syrian government used chlorine gas in two attacks, reiterating that the report is "very technical," ''quite complicated" and needs study. By contrast the United States, which backs Syria's moderate opposition, made clear after the report was circulated among Security Council members Wednesday that the Syrian government has now been found responsible of using a chemical weapon in violation of a Security Council resolution and its obligations under the Chemical Weapons Convention. "It is now impossible to deny that the Syrian regime has repeatedly used industrial chlorine as a weapon against its own people," U.S. National Security Adviser Ned Price said in a statement. Calling the use of chemical weapons "a barbaric tool, repugnant to the conscience of mankind," U.S. Ambassador Samantha Power urged the Security Council to take "strong and swift action" against the perpetrators. British Foreign Secretary Boris Johnson said Thursday the United Kingdom and its partners will press for a Security Council resolution "to condemn those in Syria for using chemical weapons, to reinforce our commitment to punish those responsible and to prevent any further use." Churkin said he spoke to Power after the report's release and they will meet when she returns from vacation "and see what can be done on the basis of this report." The Security Council is scheduled to discuss the report on Aug. 30. 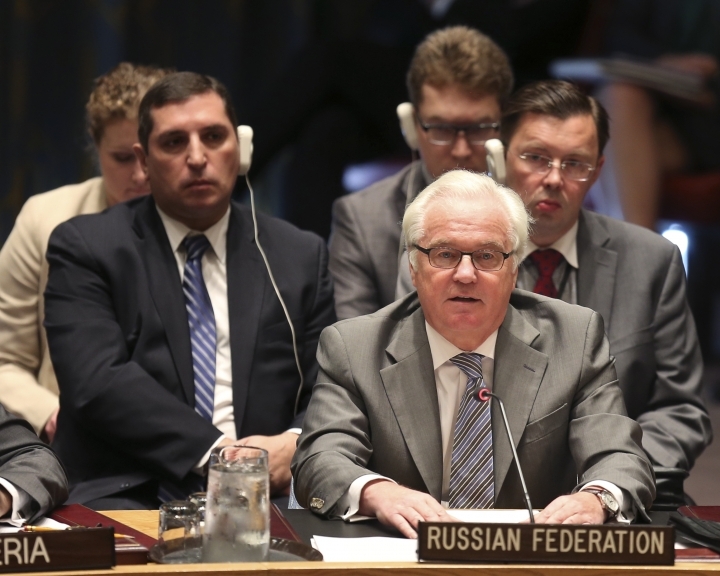 Churkin was asked about the September 2013 resolution that orders the Security Council "to impose measures" under Chapter 7 of the U.N. Charter for "any use of chemical weapons by anyone in the Syrian Arab Republic." Those measures usually mean sanctions, and Chapter 7 can be militarily enforced. "Well, we need to see what can be done on the basis of what is said in the report," the Russian ambassador replied. The report was written by the Organization for the Prohibition of Chemical Weapons-United Nations Joint Investigative Mechanism, known as the JIM, which was established by the Security Council a year ago. The JIM investigated nine cases in seven towns where an OPCW fact-finding mission found that chemical weapons had likely been used. It determined responsibility in three cases, said three attacks pointed toward government responsibility but weren't conclusive, and described three others as inconclusive. According to the report, obtained by The Associated Press, the JIM found the Syrian government responsible for two chlorine attacks in Idlib governorate, one in Talmenes on April 21, 2014 and one in Sarmin on March 16, 2015. It also said the Islamic State group was "the only entity with the ability, capability, motive and the means to use sulfur mustard" gas in Marea in Aleppo governorate near the Turkish border on Aug. 21, 2015. At the time, Islamic State fighters were attacking rebels.